During these dark winter nights, I get really sleepy and don’t feel like cooking a big meal. But because it’s cold outside, I still want to eat something warm and comforting with a lot of flavor. I frequently turn to simple meals like this one- meals that use ingredients I tend to have in my kitchen and require minimal effort. To make this cous cous, preheat your oven to 400ºF, and begin preparing your vegetables. For 3-4 servings, cut 1/2 of an onion, 1 eggplant, and 1 zucchini into 1-inch pieces. Spread the vegetables on a baking sheet, and drop on 4 cloves of garlic still in their peels. Drizzle all of the vegetables with enough olive oil to coat them evenly. Drop a few sprigs of rosemary onto the pan as well, and season the vegetables with salt and pepper. Bake the vegetables for about 25 minutes, rotating the pan half way through. 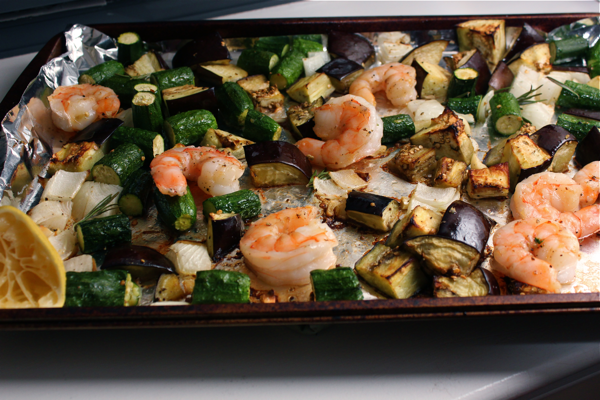 Once the 25 minutes are up, add about 8 large shrimp to the baking sheet with the vegetables. Return the sheet to the oven for about 5 minutes until the shrimp are pink and opaque. The shrimp juices will mingle with the vegetables and the cous cous once everything gets mixed together, and it adds wonderful flavor! While the vegetables bake, prepare your cous cous. Add 1 cup of chicken broth to a small pot with 1 tablespoon of olive oil and 1/4 teaspoon of salt. Bring the liquid to a boil, and then remove it from the heat. Mix in 1 cup of cous cous, put the lid on the pot, and let it sit until the cous cous absorbs all of the liquid. Then, fluff the cous cous with a fork. To get it slightly crispy, drizzle some olive oil in a frying pan over medium-high heat, and dump the cous cous into the pan. Let it fry until the grains at the bottom take on a golden color. Remove the skins from your roasted garlic. 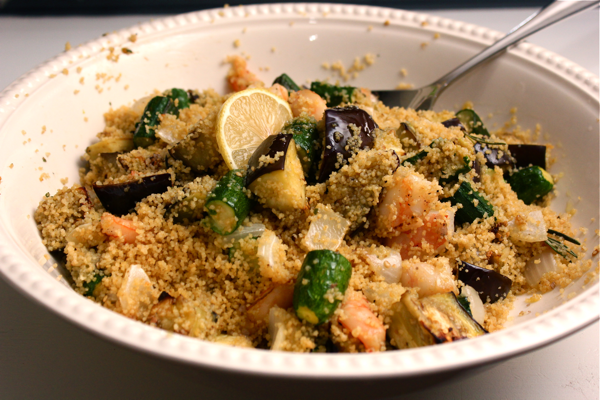 Drizzle the juice from 1 lemon over the vegetables and shrimp, and then stir them into the crisped cous cous. Serve and enjoy! This cous cous recipe makes a wonderful dinner, but can also serve as a great side dish if you omit the shrimp (or if you eat all of the shrimp out of your leftovers like we did). I hope this meal helps power you through another chilly night. Going to try this out tonight. Hopefully it will make a good Florida dish!